The problem she was referring to was that most of the people she knew did not realize that gears were still used, much less manufactured, in the United States. And, most applications that use gears today are quiet, efficient, and unobtrusive. But it wasn’t always so. In the early years of the 20th century, applications that used gears were noisy, large, and dirty. The public did not like the noise or the greasy conditions near the open gears driving street railcars. In the early days of the auto industry, timing gears were made of non-metallic materials. There was increasing demand but no technical standards to allow consistent quality or reliable interchangeable parts. Westinghouse Electric and its fully owned gear company, R. D. Nuttall Company, were major organizers of other manufacturers and equipment suppliers who came together in 1915 and 1916 to develop AGMA. Nine companies did the early work to create the organization’s constitution, and a total of 16 met at their First Annual Meeting in May 1917. To develop technical standards for gear design, manufacture, and application. To collect and disseminate statistics and information of value to the membership. To discuss subjects of interest and value to the industry. To advance the improvement of that industry. Also, from its first days, AGMA’s membership included foreign companies, such as Hamilton Gear in Canada, which was a founding member, as well as machine tool builders and academicians. By the early 1920s, the organization had over 100 members worldwide including David Brown in Huddersfield, UK; Richardson Gears Prop. Ltd. in Melbourne, Australia; and Citroen Gears in Paris, France. 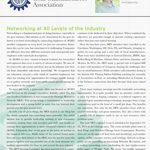 The association also collaborated with other standards-developing organizations such as SAE and ASME. The members set about creating technical committees to develop the needed standards. The new automobile and aircraft industries drove developments in materials, machine tools and tooling, manufacturing processes, and the inspection equipment and methods necessary to validate the growing production. Until the early 1930s, it was common to handle increased loads by simply increasing the size of the gear. By the early 1930s, burnishing, lapping, and grinding were familiar practices and recognized as a way to reduce gear sizes by 20 percent for a given load. AGMA’s timeline recognized Niles (now KAPP Niles) as a developer of the first generating gear tooth grinding machine. Tolerances improved, and by 1935, shaved production gears were as accurate as the master gears of 1915. By the mid-1930s, auto manufacturers were promoting their transmissions as “weighing less” than those in earlier models. From this time forward, the real story of our industry is the power density of the gearing and increasing loads. The broken teeth of cast iron gearing had been solved. More grease was no longer the solution to noisy streetcars. The industry was on the road to making gears so efficient that they would eventually be out of sight. The engine used by Orville and Wilbur Wright was a direct drive to the propeller. By the time AGMA was formed, airplanes were using gearboxes that increased speed and efficiency while reducing weight and size, which allowed the industry to advance. Today, gears are operating in the vacuum of space, millions of miles from a service center or an oil can. 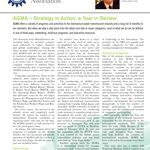 Over the past 100 years, this industry has stepped up to keep AGMA going in the recession — thanks to the machine tool builders — and collaborated with suppliers and users to solve problems that moved the technology to where we are today. At every turn, the industry’s most distinguished leaders volunteered to help the industry grow and allowed their engineers and business professionals to join committees and make meaningful contributions to develop better ways to design, make, and evaluate the gearing components needed to keep the world turning. In the upcoming year, AGMA will hold a series of events to share the stimulating history of our industry with you. I invite you to come to Gear Expo to see the exhibit of the industry’s last 100 years and to begin the celebration at our first industry dinner on October 21. 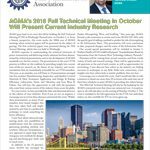 AGMA is preparing for its Centennial year in 2016 and another packed year of training opportunities for the gear industry. Whether you’re involved in engineering, the shop floor, sales, or management, there are programs designed for your professional development. Registration for all of the following programs opens October 20. As most AGMA programs sell out, make sure to register early! The design of an optimum gear set requires the coordinated effort of the gear design engineer, the gear metallurgist, and the bearing system engineer. The instructors of this course are a gear design engineer and a metallurgist who have worked collaboratively on projects for more than 40 years. Learn the roles of each of these professionals and how collaborative efforts can provide better outcomes. Additional information on gear-related problems, failures, and improved processing procedures will be reviewed. Bearings and gears go hand-in-hand and must be designed as a total system. This seminar will help participants understand the system, recognize failure modes, and design against known problems. 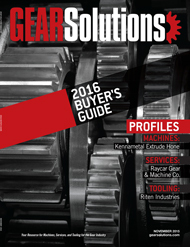 Learn from this team of experts who have worked together on optimizing gear and bearings for more than 40 years. Instructors: Raymond J. Drago and Joseph W. Lenski, Jr.
Students learn the fundamentals of gear manufacturing in this course. In the classroom, this course offers training in gearing and nomenclature, principles of inspection, gear manufacturing methods, and hobbing and shaping. In the hands-on gear lab, students can see the interaction between the cutting tool and the workpiece by using manual machines. They will understand the process and the physics of making a gear and can apply this knowledge in working with CNC equipment. This course provides participants the skills necessary to diagnose gear failures and prescribe remedies. This presentation covers six classes of gear tooth failure: overload, bending fatigue, Hertzian fatigue, wear, scuffing, and cracking. Each failure mode is illustrated by color slides and field samples. Working in small groups, students participate in a hands-on practical exam using field samples as well as a case study. This seminar provides the gear design engineer with a broad understanding of the methods used to manufacture and inspect gears and how the resultant information can be applied and interpreted in the design process. The basics of a variety of destructive and non-destructive tests — including their underlying theory, application techniques, and, most importantly, interpretation of the resultant data — will be discussed. This course explores all factors going into good gear design from life cycle, load, torque, tooth optimization, and evaluating consequences. An in-depth discussion of real-life gear failures is provided. Students should have a good understanding of basic gear theory and nomenclature before attending this course. AGMA is known for its quality advanced education courses. These courses are provided throughout the year on a variety of topics, and discounts are given to employees of AGMA member companies. But AGMA also has some free tools and online education that you should also be taking advantage of including the Online Workforce Training Series and the Skills Assessment Tool. The AGMA Online Workforce Training Series is a set of three online courses that provide training specifically for those newer to the gear industry. These courses are free to employees of member companies and only require individual account setup and completion of each course within 30 days of signing up. The series starts with the Fundamentals of Gearing. This course is a comprehensive overview of the industry. It begins with the history of gearing and proceeds through the topics of parallel axis gear basics, involute tooth form, description of the gear, diametrical pitch/module, pitch and pressure angle. This course provides instruction on a series of crucial terms used in gearing and gives students basics in nomenclature. The third course is Hobbing, which is designed to present the basics of hobbing to hobbing machine operators, gear technicians, and engineers. The course covers the entire hobbing process including essential terminology, measuring, mounting and truing the hob, mounting and truing the workpiece, and basic part inspection. 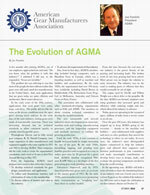 The Online Workforce Training Series can be accessed through the AGMA website at www.agma.org. The Skills Assessment Tool is available for free on the AGMA website through a link on the home page. You do not have to be an AGMA member to access the files. This tool is a matrix that assists gear manufacturers in the hiring of new employees and skills assessment of current employees. The tool guides users through a list of job positions, then five sets of skills required to complete those tasks, and the competency requirements of each skill. The tool has been designed to afford users complete customization. It was created through a special task force of individuals working in the gearing industry and has been found to be an invaluable tool to our member companies who are utilizing it in their HR function.